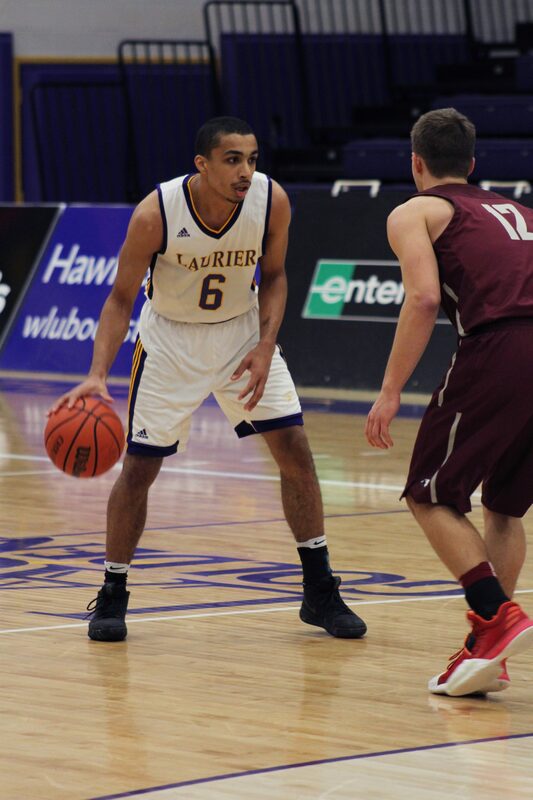 On Friday night the Laurier Golden Hawks Men’s Basketball team made their highly anticipated return to the court after a six-week holiday hiatus. The Golden Hawks opened their first game of 2019 at the Athletic Complex Gym against the McMaster Marauders, but unfortunately fell short with a final score of 79-67. The Marauders came into the game with a defensive fire that challenged the Hawks offence and they were only able to score 13 points in the first quarter. Although offensive delivery was an issue for the Hawks, defensively they had 20 turnovers and 13 steals, but were unsuccessful at converting those opportunities to steer them toward a game win. “We struggled the whole game to get our groove in and getting ball movement like we did in the first half of the season. That trickled down into us exposing ourselves defensively because at the end of the game we didn’t really have any option but to trap and put us at risk,” head coach Justin Serresse said. With no time to be upset the Golden Hawks had a quick turnaround and were on the road to Windsor ON where they redeemed themselves in an 88-79 victory against the University of Windsor Lancers. It was the efforts of Sow who brought down the house with five straight points and a set-up for Matt Minutillo to sink a three. The Hawks only hit 34 percent from the floor, and 21 percent from the three that Friday night. “The guys were getting frustrated because we weren’t making shots, but that’s just not what we do, we don’t try to get frustrated from those shots, we try to find solutions and give each other confidence,” Serresse said. Second year Ali Sow, who is no stranger to a heavy offensive output, played all 40 minutes and put up a game-high 29 points. Ntore Habimana followed Snow scoring 14 points that game. In the second half of the third quarter Laurier was able to close the gap by one point, but the Marauders turned the heat up and played both effectively and aggressively, resulting in an 11-point lead by the end of the third. Unfortunately the Golden Hawks were unable to turn things around in the fourth, and took a loss on their home court. With no time to be upset the Golden Hawks had a quick turnaround and were on the road to Windsor ON where they redeemed themselves in an 88-79 victory against the University of Windsor Lancers. In the first quarter, the Hawks had a huge 18-point lead with their lead not dropping below 15 points during the second and third quarters. During the fourth, the Lancers stepped up their game and had a comeback down the stretch resulting in the score closing to 78-74 with three minutes left of game play. It was the efforts of Sow who brought down the house with five straight points and a set-up for Matt Minutillo to sink a three. The Golden Hawks will be playing this Wednesday Jan. 9 in the Athletic Complex Gym. Tip off for the women is at 6 p.m., and men is at 8 p.m.